One thing that we’ve learned from the Smash Bros. for Wii U 50-Fact Extravaganza is that the frequency of item appearance will be changeable in the new Smash game. 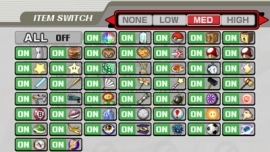 This was a very commonly used feature in Super Smash Bros. Melee, Brawl, and even on the Nintendo 64 version of the game. It wasn’t possible in the 3DS version of the game, for reasons completely unknown; I’m not usually one to complain, but I don’t understand why this was omitted, and I doubt it had anything to do with technical shortcomings. It’s not a particularly important feature, but it’s still nice and impacts gameplay a good deal. We apologize that this news comes a little late, but we’ve been a little backed up. What do you think? Did you miss this feature in the 3DS version of the game, or did you hardly notice the loss? Let us know in the comments!